A rendering of the tidal energy equipment that a New Bedford company, Littoral Power, hopes to test in the new Cape Cod Canal testing facility. 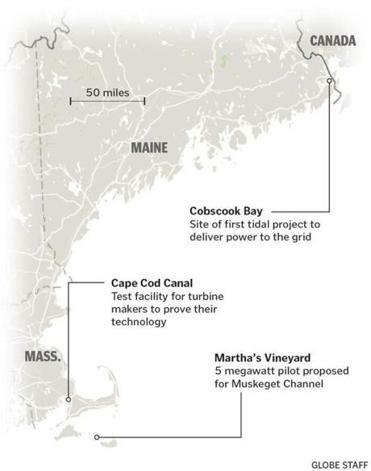 The company also hopes to participate in a tidal power project off of Martha&apos;s Vineyard. Currently, makers of tidal turbines have to lease a ship to bring their equipment to an offshore location or build their own site along the shoreline. Either option is expensive and requires a lengthy permitting process to show the test site won’t adversely affect the marine ecosystem. “Early experience was that about 70 percent of the cost of an ocean demonstration was just the permitting,” Miller said. 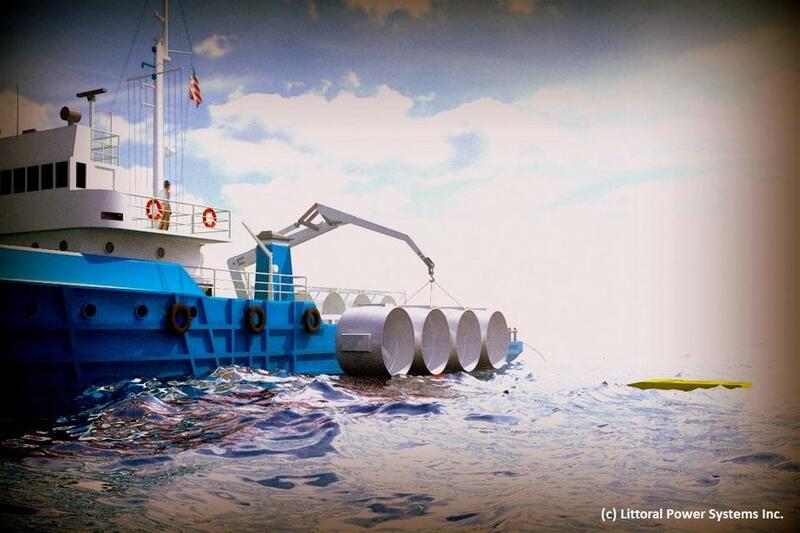 A rendering of the tidal energy equipment. The Bourne test site could help influence a long-sought attempt to install a tidal power project in Muskeget Channel off of Martha’s Vineyard. Miller’s collaborative has been working with Edgartown to win federal approval for a 5-megawatt pilot project. If that’s successful, a larger array of tidal turbines could be producing up to 20 megawatts within a decade. “The lack of a test site has been a major, major problem,” said David Duquette, the chief executive of Littoral Power Systems Inc., an alternative energy company in New Bedford. Duquette said his company hopes to test prototypes for turbines that one day could supply power to remote sites such as islands, including perhaps the Vineyard. Much touted over the past few decades, tidal power has been slow to show its promise in the United States. There are large projects underway in Canada, in the Bay of Fundy, and in Europe, off the coasts of Ireland, Scotland and France. Those have public funding, subsidies, and favorable geography — rugged coastlines, where tides rush in and out of narrow channels. But nearly all of the ideal US locations for tidal power are in Alaska, said Robert Thresher, a fellow at the US National Renewable Energy Laboratory who specializes in offshore power technologies. “It’s kind of a stranded asset,” Thresher said. Challenging conditions unique to tidal power aren’t helping. Undersea turbines must withstand corrosion and powerful currents, and generators and other electrical equipment have to be protected from the elements. “People thought that, given the wind turbine experience, the tidal technology would be fairly simple,” Thresher said. In far northeastern Maine, Ocean Renewable Power Co. is moving forward with its second tidal project in Cobscook Bay, where tides rise and fall some 20 feet over a 12-hour cycle. In 2012, the company deployed the first — and so far only — tidal energy project to deliver electricity to the nation’s power grid. The four turbines in the TidGen power system supplied enough electricity for 25 to 30 homes. The $21 million project served as “primarily a learning tool, a way to verify that our design works,” said Chris Sauer, president of the Portland, Maine, company. Sauer is developing a second-generation TidGen that he said would have four times the generating capacity and be less expensive to deploy and maintain. The company has a long-term contract with Maine utilities to supply up to 5 megawatts of power. The cost of installing the first of the new units will be $5 million, Sauer said, and he hopes to complete fund-raising by this fall; the remaining turbines will cost another $35 million. Installation would begin in late 2017, at the earliest. “Whenever you’re dealing with new technology, it always takes longer and costs more money than you think,” Sauer said. He projected that power from the tidal system would cost 25 to 30 cents a kilowatt hour. That’s expensive compared to more conventional electricity sources, but Sauer said that if the demand for turbines increases, economies of scale could make tidal energy competitive. His company has set its sights on foreign markets and, like Littoral, on Muskeget Channel. For the Martha’s Vineyard project, proponents have spent some $2 million since 2007 studying the feasibility of a turbine array about five miles off the coast. Miller said another $300,000 is needed for additional fishery and archeological studies. In Bourne, other developers tried a decade ago to launch a tidal power project at the canal. 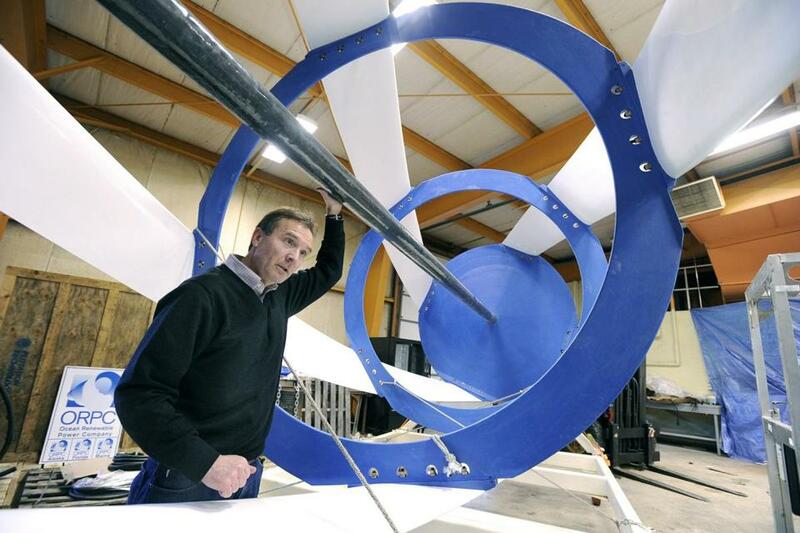 John Ferland, vice president of project development with Ocean Renewable Power Co., stood inside one of the all-composite turbines in February 2010. The turbines were placed in the ocean near Eastport. The upcoming test of the turbine, he said, is ''like a Broadway debut'': It needs to generate momentum for the project. The test stand is a more modest endeavor, funded mostly with $210,000 from the state’s Seaport Economic Council. 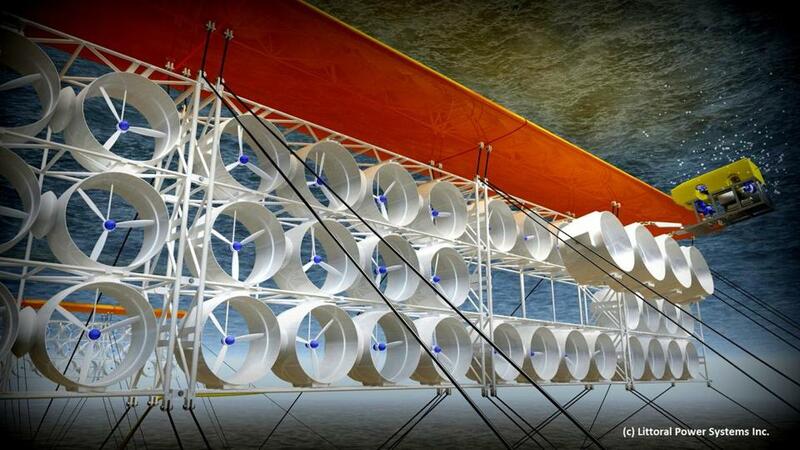 The stand can hold only one turbine at a time — up to 10 feet in diameter. It will be wired to apparatus on shore that will measure electrical output and store power in a lithium-ion battery. The output from tidal energy rises and falls daily as the tides roll in and out, subject to the pull of the sun and moon. To measure the full power curve, the test will run over the course of two lunar cycles, or about two months. Unlike solar and wind power, “tidal energy is incredibly predictable, literally for hundreds of years,” Miller said.